You have a potential product… service… or tool. Or even just an idea. Gavin Zuchlinski, founder of Acuity Scheduling, says that you shouldn’t try to develop it on your own. He knows you have a resource right under your nose that’ll help you create a winning – and profitable – concept. The lessons Gavin learned when creating his scheduling software apply to every industry, in every niche. He also has tips for how to optimize your schedule to maximize the value your customer gets – and the money you make. By the way, Gavin offers a 45-day free trial of his scheduling software at the end of the call, so stick around until the end. 00:11 Today Steve speaks with Gavin Zuchlinski, the founder and developer of Acuity Scheduling. 01:15 Gavin originally developed Acuity not for the masses, just to help his mom. 03:10 Gavin talks about the struggles he had in developing Acuity, like running his business from his iPhone because he didn’t have internet. 10:46 Gavin explains what the ideal customer for Acuity is and how he refined the service by simply asking his mother. 17:30 Gavin talks about the many different types of companies that he was surprised to find use Acuity. 21:11 Steve explains how Acuity has helped his business. 22:29 Gavin explains the other really useful features that Acuity has outside of scheduling. 25:10 Steve and Gavin talk about the supposed impersonality of dealing with scheduling platforms and how it doesn’t really matter to the customer. 28:44 Steve explains the benefits of having Acuity setting up barriers between you and clients and how the system can say “no” for you. 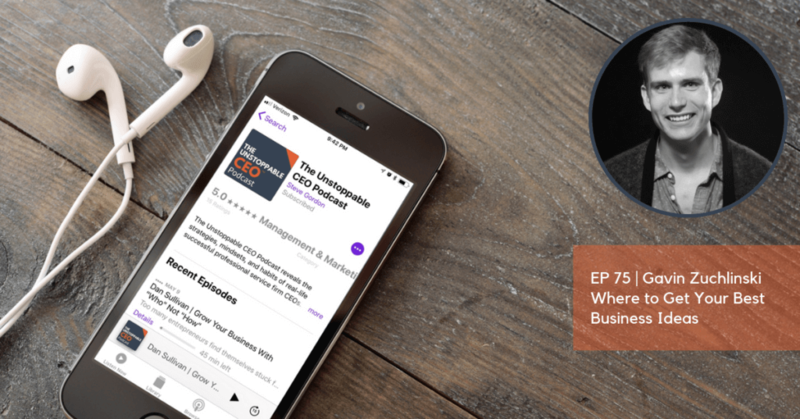 32:58 Gavin let us know how to find more about Acuity by giving the Unstoppable CEO listeners their own link and extended offfer.